Today I attended the funeral of a man I didn’t know well but who was a constant if irregular presence in my life since the mid 70’s. I first saw Paul Ashford when my mother brought me to see Joseph and the Amazing Technicolor Dreamcoat. The production was meant to take place in the Olympia Theatre but part of the roof collapsed and so the show was moved to the improbable location of the State Cinema in Phibsboro. I remember that as we took our seats, the band/orchestra were making their way through the auditorium to the makeshift ‘pit’. Paul Ashford was not tall but I was about 10 years old. He had a mop of curly hair and the most beautiful blue eyes. I remember him clearly as he strolled down the aisle in a battered leather aviator jacket with the big furry collar up around his ears. I thought he was gorgeous. At the time, the role of Pharaoh was played by a singer called Cahir O Doherty who did a mean Elvis impression. My mother thought he was the hottest thing since…. well, Elvis Presley. O’Doherty had his own band, imaginatively called The Dazzle Band – this was the era of Glam Rock remember. Cahir O Doherty and the Dazzle Band played in cabaret venues throughout the city. My mother, if truth be told became a bit of a groupie, following the Dazzle Band to such exotic places as The Drake Inn, Finglas, The Tudor Rooms in Barry’s Hotel off Parnell Street and the Noggin Inn in Sallynoggin. She brought me with her, as junior groupie. I was 13 years old, getting into over 18 venues and drinking babycham! Cahir O’Doherty didn’t really do it for me, but I always thought that Paul was very cute! The Dazzle Band faded out, I became a hippie and hung around with my friends as opposed to my mother. I left school and started working. Dublin was a dull old place and we were in the middle of a recession. Punk rock was spewing out its anger all over the place. But on the southside, a new band hit the scene. Stepaside’s Sunday gigs at the Sportsman’s Inn in Mount Merrion were legend. The band was fronted by Paul Ashford who played a mean bass guitar and wrote the bands songs, their best known tracks being The Last Resort and the impossibly romantic Always Loved You and I Always Will. Paul was still cute. He had a smile that lit up his whole face and a boyish charm. Although by now it was the keyboard player Dennis Woods who turned my head. The early 80s gigs faded out too. But I still met Paul regularly around south Dublin. He always had time to say hello and ask after my mother. After Stepaside he formed his own band who played at my brother’s wedding in the 90s. 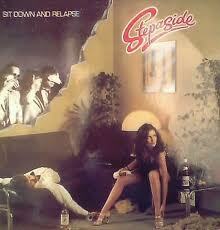 Then in the last few years, Stepaside occasionally reformed and played gigs in local pubs. It was a joy to go along and sing along to those same songs we bopped about to in the Sportsman’s Inn. Today in a church in Bray, I listened to his former band members and friends play soft versions of those same songs as we said goodbye, much too soon to a great guitarist, song writer and nice guy. Thanks Paul for the music, for the memories and for making me feel so grown up when I was 13 years old. Lovely post, Barbara, I love how you write about Dublin. May he rest in peace. On a selfish note I wish my mam had brought me to gigs and let me drink babycham! She sounds great! Thanks Ellen and Niamh. Apoologies I wrote the post last night and only today noticed all the mistakes. They have been corrected now. God, there goes my credibility as a dutiful, sensible mother. Seriously, they were very enjoyable days and I remember them so very well. It's a really lovely tribute to a lovely guy, Barbara, and may he rest in peace. I think you'd better hold off on the rest of my biography until I've shuffled off this mortal coil. That's a lovely tribute, Barbara. Thanks from all Paul's friends. Noirin – your credibility went years ago! And look there's Cahir O Doherty…. wanna watch it Cahir – now she knows where you are!!! Thanks Paul's friends for your comments. The Facebook page is great. Every Tuesday evening – The Coconut Grove, Stillorgan for the Paul Ashford Band – then every Sunday form Hotfoot at the same venue. The sound and the buzz was incredible – the power coming of the stage…….I have Sit Down and Relapse on Vinal – and just got the CD last year – this evening as I drove through Swords 'Always Loved You' blasted out on my CD player – a complete classic. Now I's shocked and saddened to see that Paul Ashford is gone.